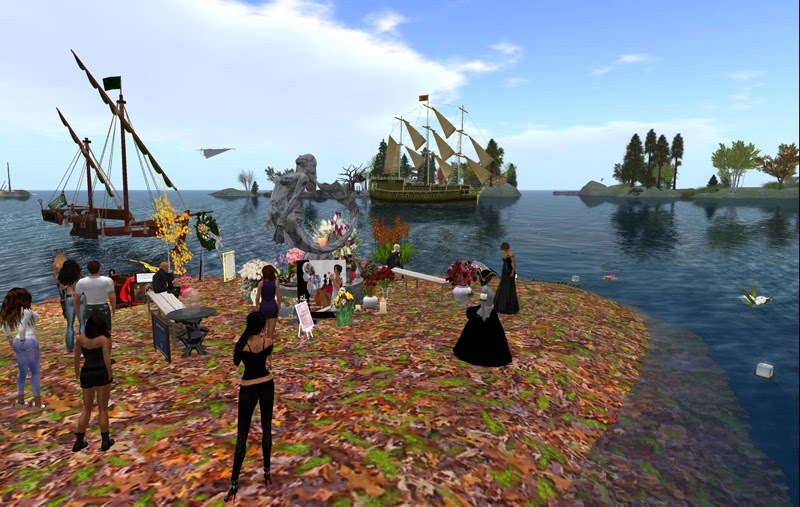 On Monday night a spontaneous event occurred in the Blake Sea area that brought together three communities in a sim filling event to honor one of our own. The SL sailing community and the United Sailing Sims recently lost one of their key leaders to cancer. Fanci Beebe was one of the the driving forces behind the Sailor’s Cove sims and Fisher’s Island Yacht Club passed last week. Her SL partner Patrick Leavitt announced on Saturday Fanci’s passing. She died at home surrounded by family. SL memorial services are being planned. Over in the Fanci’s Deep sims (named for Fanci) we have created a small island where folks can come by and leave a memorial in her honor. Fanci’s Memorial Island is located at Fanci's Deep NE (15/14/22) and will stay in place through October. The memorial will then be moved to Union Passage and the Fanci’s Deep facilities there. Fanci’s Deep is a new development in the United Sailing Sims that will serve the needs of three communities. Merfolk are creating a Mer Community in the four and a half sims centered on Fanci’s Deep. 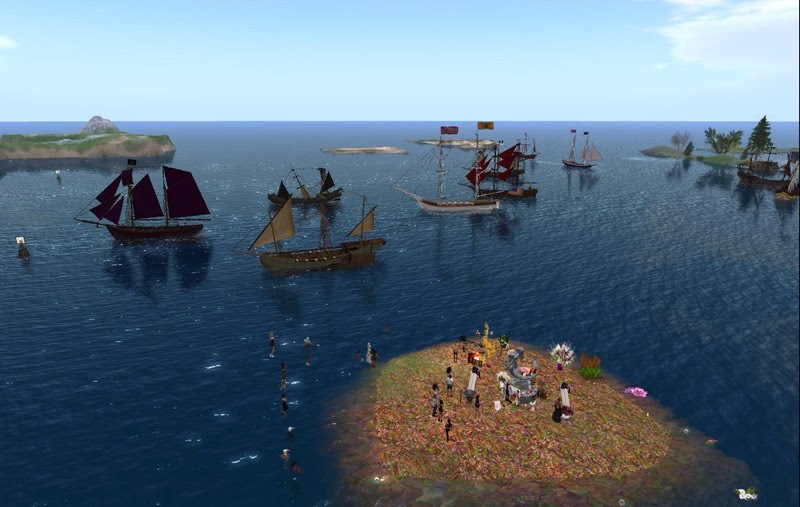 Additionally the pirate community now uses Fanci’s Deep for their contested water battles (now that the Contested Water sims in the Blake Sea have been closed to full rezz and combat). And of course the sailing community reaps the benefit of these changes by having the southeastern portion of the Blake Sea returned to peaceful sailing and boating. Last night the Blake Navy and Pirates organized a fleet to sail past Fanci’s Memorial Island and fire broadside salutes to Fanci. Sailors and Merfolk from all over SL were there to witness and participate in the event. The island. which is located at the four corner intersection of the four Fanci’s Deep region, filled up before the event started and the overflow crowd spilled into the other three Fanci’s Deep regions. It was very exciting and very touching to witness the some dozen ships of the fleet sail in from the west and pass the Memorial and crowd guns firing out to sea in honor of Fanci. Many thanks to Amanda Dallin and Blue Manbi who organized the fleet on short notice.